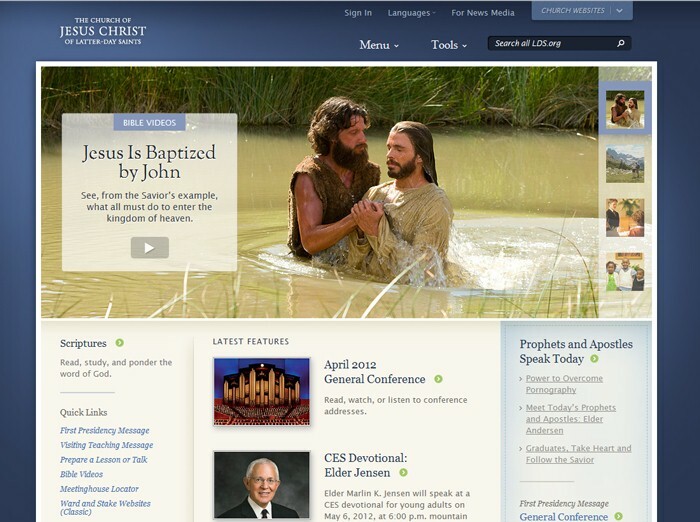 The Church has updated its flagship site, LDS.org, many times since it was first created in 1996. 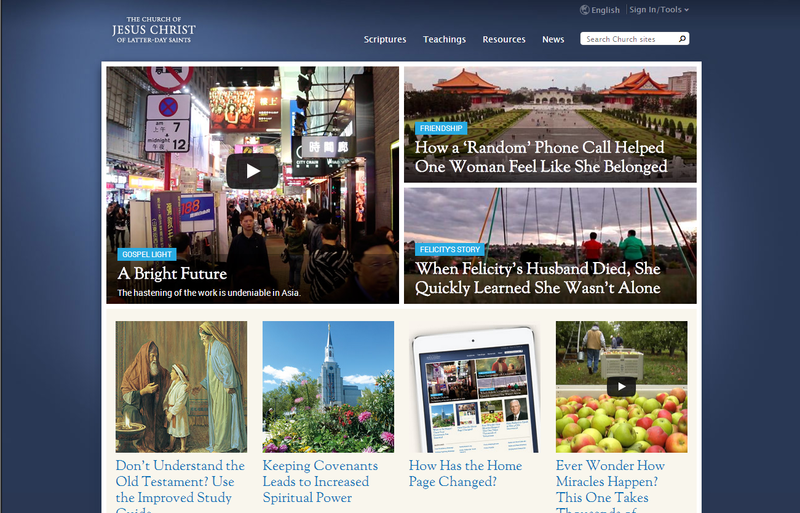 From a basic domain-claiming site in the early days of the Web to today’s robust, information-rich experience, the Church has offered more and more content to members and to the world. The year 2000 also saw major redesigns and content added to the website. 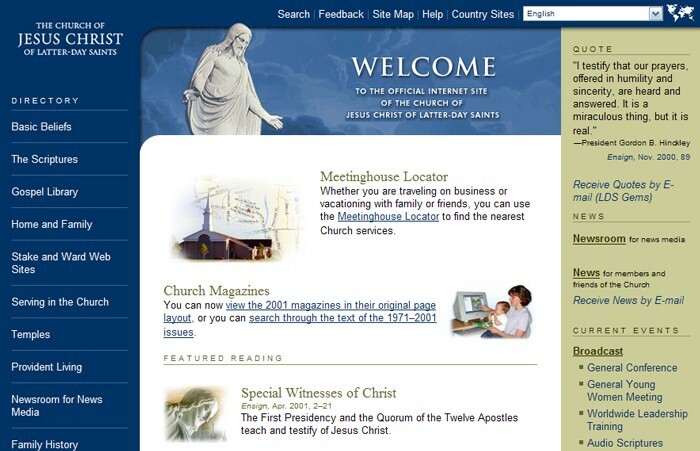 The Church’s message called “The Living Christ” was posted on January 1, 2000, followed by the first Internet version of the scriptures in May of the same year. The conversion of the scriptures from a print version to an online version proved to be very beneficial. Errors were revealed such as wrong references and typos. The Church was able to clean up the scriptures by posting them online. At the turn of the millennium, the website shifted focus a bit. Designers allowed it to be more dynamic, allowing users to customize content. Ideas for features such as a youth site, a portal, feedback, calendar, news were planned. Some of these ideas are only now being launched. The goal was to release the new site on June 30, 2000. Using a content management system put out by Vignette, and a language called Tcl, the site was created. It presented huge challenges to the Church and developers. The site required major hardware upgrades. With less than a week to go before launch, the website was still not functional. One problem was so difficult that Vignette experts were called in for support, but the result was many of hours of work with no success. Ultimately, the consultants gave up and went back to their hotel, at which point the remaining team members made it a matter of prayer. Within a half an hour, ideas came in and the problem was solved. On June 30, Elder L. Tom Perry pushed a button that launched the website publically. By July 2000, the website had over 20,000 users per day. 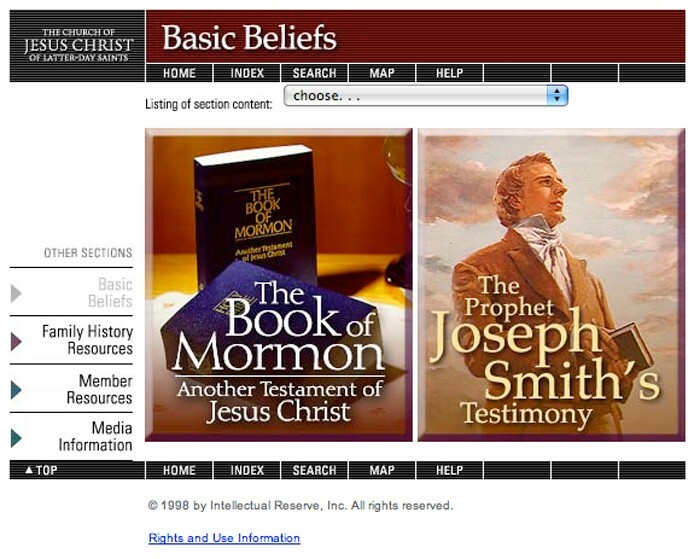 Later that year, the Church launched additional language capability for Newsroom and the LDS Catalog. The Meetinghouse Locator not only provided support to the members but also made the Church realize that many of the addresses were out of date and wrong. 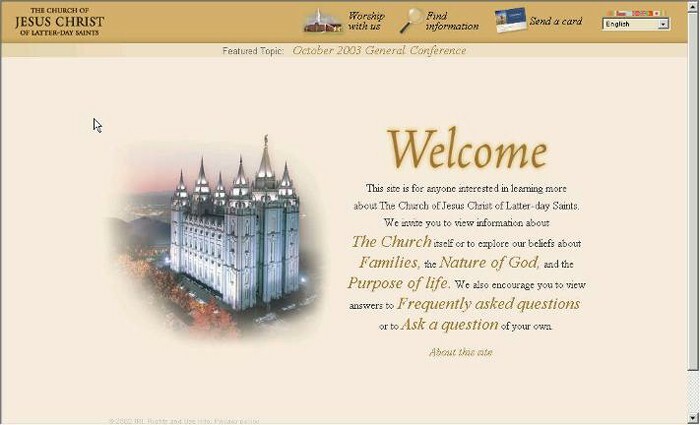 In July, the stake and ward websites were first piloted and released to the general membership. The Young Women’s general presidency helped design email pass-along cards to invite people to learn about the gospel. Elder Dallin H. Oaks announced these cards and the new website in general conference. Within one minute of his announcement, the servers became overloaded. The IT team realized that the outage had been caused by the number of cards being sent out by individuals who were supposed to be listening to the rest of Elder Oaks’ talk. Country Websites were added in 2002, which allowed countries to use templates to create language-specific websites. The Perpetual Education Fund content was also added, along with temple open house reservation systems in 2002, starting first with the Nauvoo temple. Also in 2002, LDS.org went down for three days due to some tables that were deleted in a database. During the outage, backups failed and a new program was created to ensure that major outages would never happen again. Another redesign was in the making in 2003. The current website was getting too crowded, and the Church developed fly-out menus and trained all developers to use Java. 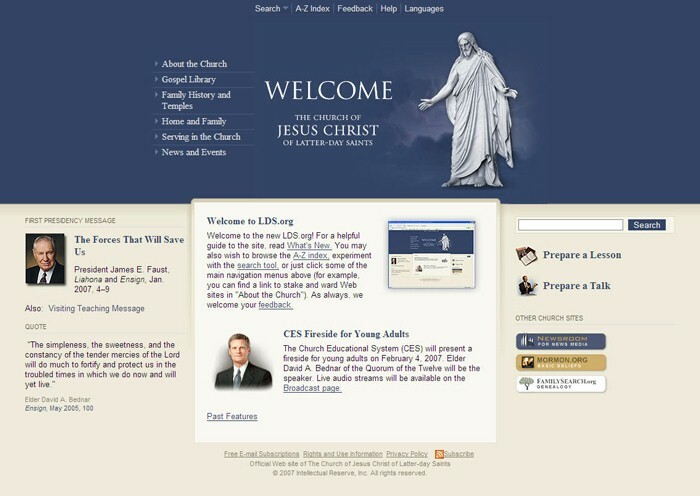 In 2007, LDS.org 2.0 website was launched. The redesign changes from the original site to version 2.0 resulted in a lot of usability questions. With this in mind, the LDS.org 2.0 website was left up when the LDS.org 3.0 was released in November 2010. As a result, the transition to 3.0 went relatively smoothly. 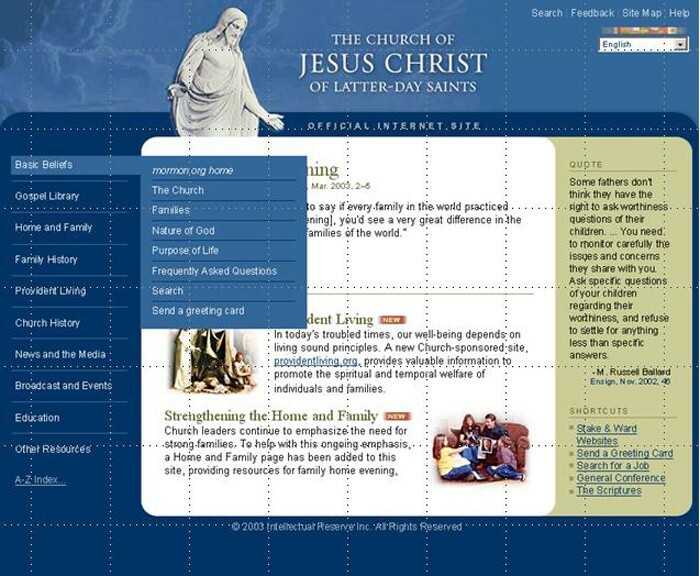 The newest version of LDS.org uses an XML database with XQuery for accessing data. LDS.org 3.0 has much more advanced technology and now includes Calendar, Directory, Maps, and other tools, all of which use the internal Java stack. The history of LDS.org has been full of prayerful and inspiration-driven experiences. The site has evolved along with the Web, often solving problems in innovative and award-winning ways. LDS.org has become a key method of spreading the gospel using modern tools, blessing the lives of members and non-members throughout the world.